When I was a little girl I was certain that wedding dresses were white. I didn’t know why, that’s just how they were drawn in my story books. 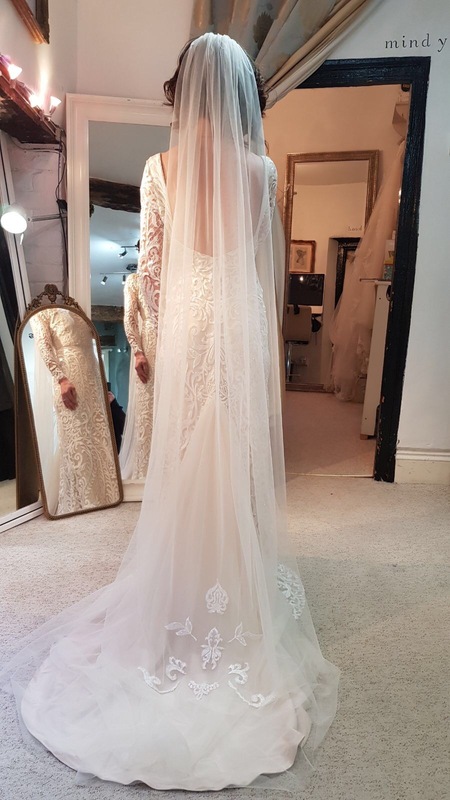 When it came to choosing my own wedding dress, I realised that wedding dresses are not always white and for a good reason, I look terrible in white! What excites me as a bridal wear designer, is the fact that colour is being brought back into bridal wear and when I hear the thud on the doormat of the new fabric swatches from my fantastic fabric and lace suppliers, I can’t wait to start playing with ideas! Having colour in your wedding dress does not mean that you have to opt for shocking pink! Using subtle colours in shades of gold, blush or blue can be much more flattering for a brides complexion and brings a softness and depth to a gown, that cannot always be achieved if we stick to the one flat colour. 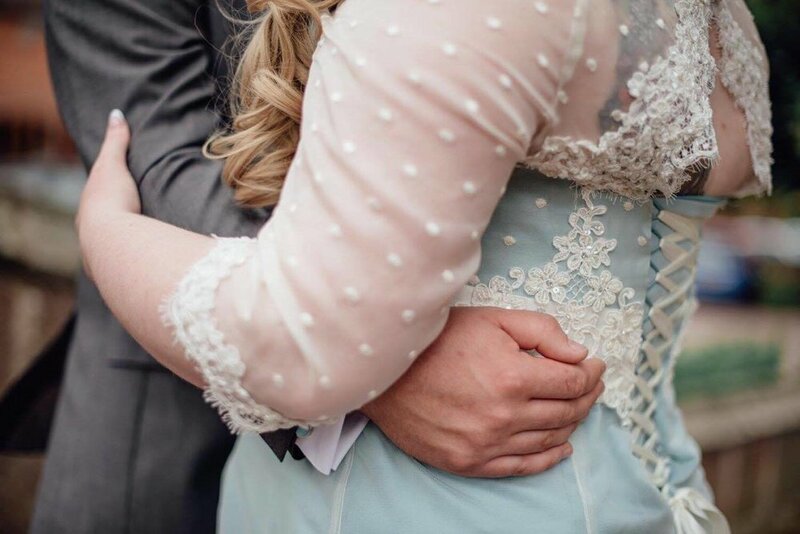 Personally, I love combining a little soft colour with an ivory lace as this difference in shade can really make the lace ‘pop’ and become much more of a feature on a gown. As an example, this delicate ivory Raschel lace has been captured on ivory, champagne & blush silk. You can really see the difference in the effect. You can really see the effect in our Rosemary Rose design. The blush silk crepe backed satin has enough colour to enable the ivory leaf design of the lace to be a lot more prominent. This ivory lace has a gold filigree thread running through the design which gives a sense of depth to the design. This lace has a vintage silver thread accentuating the embroidered floral design ensuring the lace really stands out against the ivory silk. This delicate Guipure lace in blush pink stands out against the ivory silk beneath resulting in a lovely feminine detail. It is these wonderful combinations that are being selected by more and more brides and the results are simply stunning! Helen chose a beautiful Sandwash silk in champagne to set off the ivory, beaded lace of her bohemian inspired gown. This silk was so soft to the touch it draped beautifully and the warm tones really set off the bold symmetry of the lace. This colour was softened using layers of ivory tulle in the train and the ivory veil. Having the coloured silk base overlaid with layers of tulle gives a real sense of depth to a skirt while keeping it lightweight. Deborah’s incredible gown was created in blush pink slub silk overlaid with a striking ivory lace with a gold thread running through it. The pink background really makes the lace stand out and we pulled out the gold in the lace through using a gold busk and eyelets on the corset. We softened the pink colour on the skirt through creating an ivory silk Organza overlay to support the lace and create a bustle effect over the pink silk. This creation was perfect or Deborah’s Victorian themed wedding and the gold in the lace added a real sense of decadence! Carole’s 1920’s inspired gown used a lightweight silk crepe backed satin in champagne to set off the elegant Chantilly lace of her gown. The colour was pulled through more strongly by having the sash in just the Champagne silk. 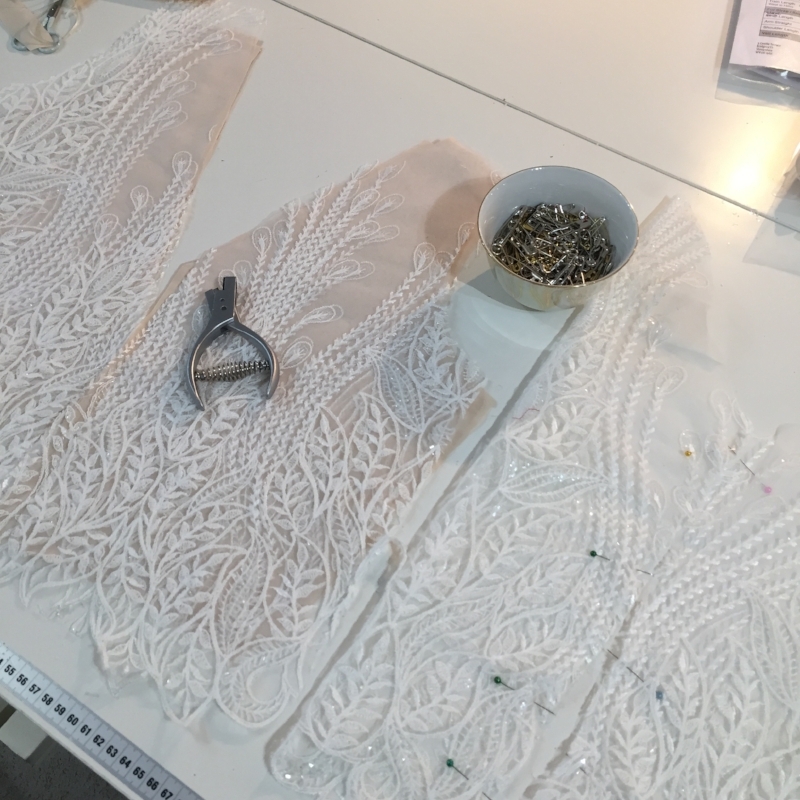 The lace was cut a little fuller so it stood away from the silk, allowing the light to shine through the lace layers and add a real sense of movement. Hannah is such a colourful person that the idea of wearing a plain dress just didn’t seem right for her, but she still wanted to have that little nod to tradition. 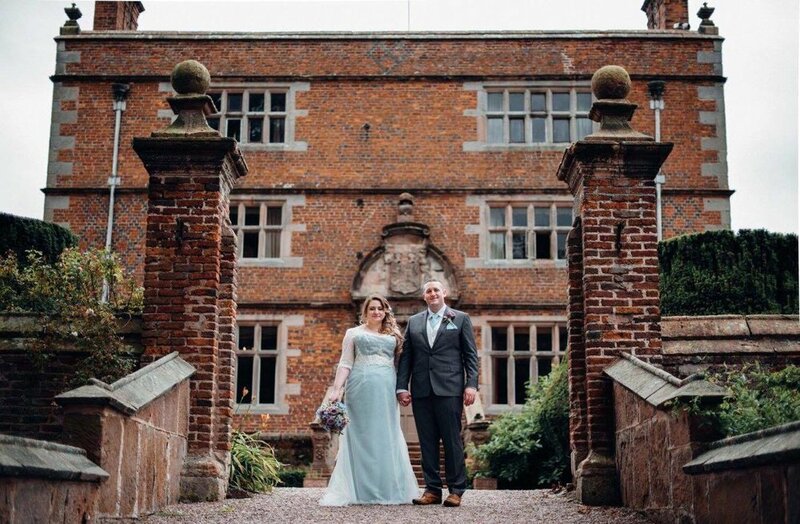 Hannah chose a wonderful tiffany blue satin for her gown which we then overlaid with ivory tulle, ivory silk polka dot organza and a heavily embellished ivory lace. The contrast of the colour shining through the sheer ivory layers meant that Hannah still felt like herself in her beautiful wedding dress. So the possibilities are endless and we are thrilled that our fabric suppliers are keeping up with this move, adding beautiful subtle shades to their silk and lace options. If you would like to explore the possibilities of a splash of champagne, a hint of blush or a little something blue (or any other colour for that matter) for your perfect wedding dress, please do not hesitate to get in touch!